Baloch won the die roll and chose to play first. He revealed Danger! Nessie!, and discarded Danger!? Jackalope?. He Special Summoned Nessie and drew a card, then Jackalope Special Summoned Danger!? Tsuchinoko? from the Deck. He used another Nessie from his hand, this time discarding Infinite Impermanence. He Special Summoned Nessie and drew a new card. He Normal Summoned Phantom Skyblaster and created one Skyblaster Token. 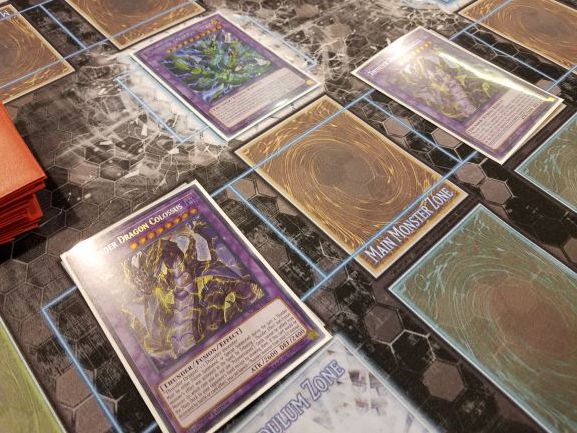 He used all his monsters except one Nessie to play Saryuja Skull Dread, and it let him draw four cards and return three to the Deck. He had Saryuja Special Summon Thunder Dragondark, then activated Thunder Dragon’s effect to add another Thunder Dragon to his hand. He used that one to get his third Thunder Dragon, then used Thunder Dragonhawk to Special Summon a Thunder Dragon. He Tributed Dragondark to play Thunder Dragon Colossus, and Dragondark added Thunder Dragon Fusion to his hand. He used his Thunder Dragon to play a second Thunder Dragon Colossus, then activated Thunder Dragon Fusion! He shuffled two copies of Thunder Dragon into the Deck to play his third Colossus! All three Fusion Monsters were in their Defense Position, and all had an extra 300 ATK/DEF from Saryuja Skull Dread. Muy had a hand of Pot of Duality, Gold Gadget, Union Hangar, Monster Reborn, and Called by the Grave. The effect of Thunder Dragon Colossus was really hurting him. He drew Ash Blossom & Joyous Spring and started off with Pot of Desires, drawing A-Assault Core and Rivalry of Warlords. He activated Union Hangar and Normal Summoned Gold Gadget, which Special Summoned Assault Core. Union Hangar attached B-Buster Drake to Assault Core. He Set Rivalry and Called by the Grave. Baloch drew his card, and Muy flipped Rivalry. Baloch chose to keep his Thunder monsters. He banished Thunder Dragon Fusion from his Graveyard, and Muy used Ash Blossom to negate it. Baloch banished a Colossus and Thunder Dragonmatrix to play Thunder Dragon Titan! Dragonmatrix put another Dragonmatrix in his hand. He turned his Colossi to Attack Position, then activated Thunder Dragon from his hand. He added another Thunder Dragon to his hand, and Titan destroyed the Set Called by the Grave. Baloch used Thunder Dragon from his hand again, getting his third copy, and Titan destroyed Union Hangar. Titan destroyed Gold Gadget in battle, which Special Summoned Silver Gadget in Defense Position. A Colossus destroyed Assault Core, which was protected by Buster Drake, and the last Colossus attacked Silver Gadget. Muy Special Summoned Gold Gadget from his Deck. Muy drew Solemn Strike. He Set it. Baloch used Thunder Dragondark from his hand, getting another Dragondark, and activated Thunder Dragon Titan. Muy used Solemn Strike to negate the effect and Baloch banished two cards from his Graveyard to keep Titan on the field. Baloch continued, using Dragonmatrix to boost a Colossus by 500 ATK (in addition to the 300 from Saryuja earlier). It attacked Assault Core, and Muy added Buster Drake to his hand. The other Colossus attacked Gold Gadget, which brought Silver Gadget to the field. Titan destroyed that, and Muy had no more Gadgets. Muy drew Pot of Desires. He played it and drew Terraforming and World Legacy Succession. He played Monster Reborn to Special Summon Nessie from Baloch’s Graveyard, then Set Buster Drake. Baloch revealed Danger! Mothman! from his hand, and discarded Mothman. Muy drew Assault Core and discarded Terraforming, and Baloch discarded Thunder Dragon. He sent his a Colossus and Titan to destroy Muy’s monsters, and the boosted Colossus attacked directly. Muy drew Infinite Impermanence. It would be no help at this point – Thunder Dragon Colossus had done too much to inhibit his strategy at this point. He revealed his useless hand and moved to his Side Deck! Muy began this time with Ash Blossom, C-Crush Wyvern, Union Hangar, Gold Gadget, and Heavy Mech Support Armor. He played the Hangar and added B-Buster Drake to his hand. He played Gold Gadget and Special Summoned Buster Drake, and used the Hangar to equip Buster Drake with a Crush Wyvern from his Deck. He used his monsters to play Underclock Taker. Crush Wyvern and Buster Drake activated – he searched out Assault Core and Special Summoned it. He used Underclock Taker and Assault Core to play Decode Talker, then Special Summoned ABC-Dragon Buster! 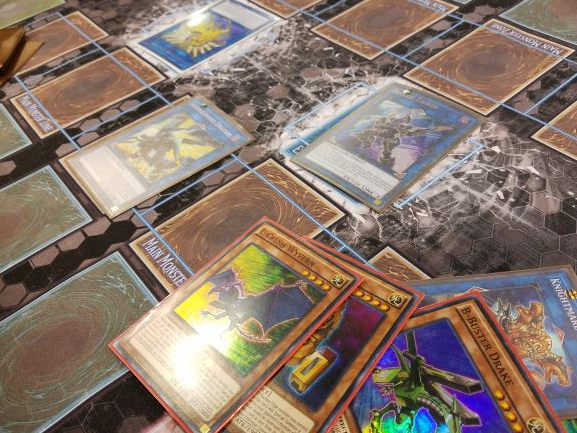 Baloch played Infinite Impermanence on ABC-Dragon Buster, and Muy responded by Tributing it to Special Summon parts A, B, and C (Decode Talker pointing to B and C). Union Hangar triggered and Baloch responded with Twin Twisters, discarding Nessie to destroy the Hangar! Nessie’s effect added Jackalope to his hand. He activated the Jackalope, discarding Tsuchinoko. He Special Summoned Jackalope and drew a card, then Special Summoned Tsuchinoko as well. He used Thunder Dragon, and Muy negated it with Ash Blossom. Baloch used Dragonhawk to Special Summon Thunder Dragon. He used all his monsters to Link Summon Knightmare Unicorn. He activated Thunder Dragon Fusion next, combining Dragonhawk and Thunder Dragon into Thunder Dragon Colossus! Unicorn destroyed Crush Wyvern, which Special Summoned another Crush Wyvern in the same zone it had been. Colossus destroyed Buster Drake. Muy drew Ash Blossom. He used Assault Core and Crush Wyvern to Link Summon Knightmare Cerberus, and used all three of his monsters’ effects. Crush Wyvern Special Summoned Heavy Mech Support Armor, Assault Core added another Crush Wyvern to his hand, and Cerberus destroyed Colossus. He used Support Armor’s effect and revived Buster Drake, and used them both with Cerberus to play Borrelsword Dragon! He had A, B, and C in the Graveyard to bring forth another ABC-Dragon Buster, and Baloch conceded! 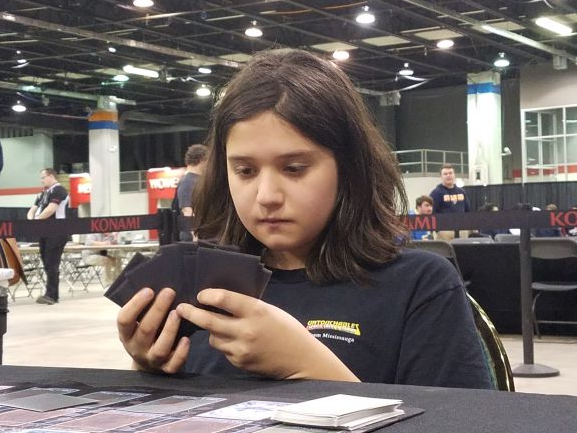 Baloch started the final Duel with Thunder Dragon, and had it negated by Ash Blossom. Baloch used Dragonhawk to bring Thunder Dragon to the field, then activated Jackalope in his hand. He discarded Thunder Dragonroar and Special Summoned Jackalope. He Tributed Jackalope to play Dragonroar, then used both of his Thunders to play Some Summer Summoner. Dragonroar Special Summoned Dragondark from the Deck. He Tributed it to play Thunder Dragon Colossus in Defense Position, and Dragondark added Thunder Dragon Fusion to his hand. 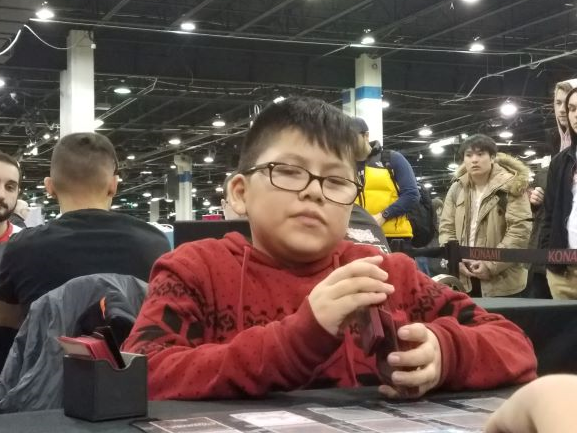 He activated it, shuffling Thunder Dragon and Dragondark back into the Deck to play a second Colossus. He then Tributed Some Summer Summoner for his third Colossus! Muy had a hand of Silver Gadget, Gold Gadget, A-Assault Core, and Monster Reborn. He drew Dogoran, the Mad Flame Kaiju. He Set Gold Gadget, completely locked down by the trio of Thunders. Baloch banished Thunder Dragon Fusion from his Graveyard to add Thunder Dragon to his hand. He banished a Colossus and Dragonmatrix from his hand to play Thunder Dragon Titan! He used Thunder Dragon to get one more Thunder Dragon, and Titan destroyed Gold Gadget. Muy Special Summoned Silver Gadget from the Deck, and that let Muy Special Summon A-Assault Core, with both monsters in Defense Position. Baloch used Thunder Dragon again, and Titan destroyed Assault Core. He used Tsuchinoko with two cards in hand, and discarded Thunder Dragon. He Special Summoned Tsuchinoko and drew a card. He went to the Battle Phase and Muy offered the handshake! 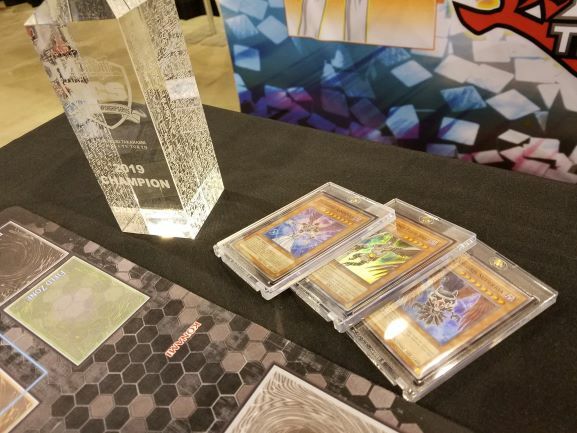 Levi Baloch is your YCS Chicago Dragon Duel Champion!